Abortion in Canada is big and it’s wrong. It’s big because there are no limits to abortion in Canada, resulting in the death of about 100,000 children in Canada every year. It’s wrong because it goes against Jesus command to love others (Matthew 22:37-40), which includes unborn babies and mothers. The truth is that abortion kills a living human being and hurts women in ways unimaginable. Where abortions have happened, we’re thankful Jesus Christ went to the cross to bring life and healing to our broken world. There are ways we can get informed and involved to, over time, reduce the number of innocent unborn children killed in Canada each year. Mark Penninga gives a look at the Pro-life movement in Canada, answering common misconceptions and providing methods to get informed and involved. Why is it that this year alone over 80 laws have been passed in the United States restricting abortion and yet in Canada we have not been able to pass one law in over 20 years? It is easy to dish out the blame: It’s our secular society! The Supreme Court! Our gutless politicians! Pierre Trudeau! Stephen Harper! The evil mainstream media! … and so on. But an honest analysis will reveal that at least part of the problem lies with us – the pro-life movement in Canada. That’s a statement liable to raise both eyebrows and blood pressure, but it is also a truth that is verified time and time again by those who are most intimately involved in this battle, including MPs, pro-life leaders, and even radical pro-abortion activists. It is also something that more people are finding the courage to openly admit, knowing full well they will be challenged for it by the pro-life community itself. But if part of the problem is with ourselves, that is actually very encouraging. It means that the appalling reality of 100,000+ abortions every year in Canada can be changed. There are a lot of people and institutions that we may not be able to change. But we can definitely change ourselves, including our strategies. Abortion legislation could be advanced in Canada if the pro-life community can move beyond a hidden and long-standing dispute that has mired our efforts for over twenty years. Key leaders and organizations within the pro-life movement have been opposing many efforts for abortion laws on the grounds that we may not support or advance laws that do not give equal protection to all unborn children, even if it is a step in that direction. So, for example, they would oppose legislation that would make abortion illegal only in the third trimester, because they would view such a bill as legitimizing abortion in the first two trimesters. This position sounds convincing because we know that it is wrong to compromise our conviction that all human life must be protected. But there is no reason why we would have to compromise this conviction when supporting laws that limit the evil of abortion as much as is humanly possible in this sin-filled world. That’s the great news – that we can, in good conscience, proactively fight against abortion in our Parliament and Legislatures and see real successes in the coming decade. We can do this by closing the gap between public opinion and the current status quo which legally permits abortion throughout all 9 months of pregnancy. One step at a time, we can expose and limit the ongoing injustice of abortion that our society is trying so desperately to hide. And we can do this together, as a united pro-life movement. There is much reason for optimism and hope. How can I be so sure we can start seeing real successes? This is one of those issues that take more than a few facts, Bible texts, or talking points to build a case. In fact, it has taken me years to study this issue and discuss it with pro-life leaders, pastors, MPs, and friends. Although this may be a longer than usual read, the issue is of critical importance if we are serious about making progress in the abortion fight. So please, read on! Stephanie Gray from the Canadian Centre for Bio-Ethical Reform has done a good job explaining how there are three arms of the pro-life movement in Canada; she labels them the pastoral, prophetic, and political arms. Understanding these three arms and their unique responsibilities is key to understanding how we should move forward. There are over 135 pregnancy care centres in Canada that come alongside pregnant women with the help they need to choose life and then have their child. They provide a range of services including pregnancy-related information, crisis phone lines, counselling, pregnancy tests, maternity clothes, and even financial help. Examples of the prophetic arm include billboards, marches, LifeChain, bumper stickers, the Genocide Awareness Project, TV ads, and word-of-mouth. After decades of work by the prophetic and pastoral arms, as well as the inescapable impact of abortion on the health and lives of millions of Canadians, the reality is that a significant majority of Canadians disagree with the status quo – the lack of any restrictions on abortion – even if many may consider themselves pro-choice. The Canadian public want either a complete ban, or at least some restrictions on abortion. This should not surprise us. Canada is the only country in the Western world without any legal restrictions on abortion. Our Supreme Court has made it clear that it is looking to Parliament to change that. This has to be done by our Parliament and Legislatures and it is the political arm of the pro-life movement that needs to work towards this goal. Examples of laws that could be proposed include gestational limits (e.g. a ban on abortion after 12 weeks) and requiring the informed consent of the mother. In the US, Americans United for Life produces a large book every year detailing the many different pro-life laws enacted in each state. Canada’s pro-life movement has for the most part avoided this realm. Campaign Life Coalition (CLC) identifies itself as the political arm of the movement in Canada, though the reality is that most of its efforts fall within the prophetic arm (its annual March for Life in Ottawa, its national pro-life newspaper Interim, etc). Although it speaks about many political issues, it does so from the sidelines rather than assisting MPs, MPPs, and MLAs with actual legislative efforts. The same is true for most pro-life organizations in Canada. They follow political developments, but the reality is that very little effort is directed towards advancing laws. Their work has value, but it has to be understood as fulfilling the role of a prophet more than a king. Although there are pockets of political activity happening in various parts of the country (e.g. defunding campaigns in some provinces) most of what is done comes from the Parliamentary Pro-Life Caucus, made up of MPs and Senators, who meet monthly with this goal. But their work is limited by time and resources. They have busy lives doing the work of an MP and can’t organize a grassroots campaign to support a bill. On the provincial level, even less is being done in the political arm. Most provincial pro-life organizations are geared towards education and coordination, not advancing pro-life legislation. The bottom line is that Canadians would be shocked at how few people there are working in the genuinely political realm. There is very little strategy or long-term vision. It is crucial that while these arms share a common heart to defend life from conception to natural death they each have different roles, strategies, and players. For example, with good reason we don’t put graphic pictures of aborted babies on the walls of a pregnancy care centre. In that context they would most likely hurt, rather than help, the effort to counsel a woman to not have an abortion, or to heal after having one. And yet an educational group – the prophetic arm – might use these same images on a university campus, to prompt debate. But just because the pastoral arm – the pregnancy care center – uses a different method than the prophetic arm, it does not mean it is “compromising” the pro-life stance. The arms have to know their respective audiences, opportunities, and limits. The focus of this article is the political realm. What is the role of the political arm and how should it function? Pro-lifers with a biblical foundation recognize from Romans 13 that our government officials have been put there by God, with the purpose of promoting order and the common good and restraining evil. But note carefully that the Bible does not say that the state has the task of eradicating evil. There is the assumption that it is impossible for the state to do this. Human nature is such that we are sin-filled people. That can’t be changed – in Psalm 51:5 David goes so far as to say that he was even conceived in sin. The state is not God (though it is more and more lifted up as a god). It cannot get rid of all evil in society. But it has been commanded by God to restrain it and has been given the authority to do so. Abortion is yet another expression of our fallen humanity. As long as we live on this earth, no government is going to be able to end abortion, even if it was outlawed. The point is that government can only do what it is able to do. And in a sin-filled world, that means limiting evil. So one reason why the political arm of the pro-life movement in Canada is so sparse is because Christians don’t like to work in a realm where evil can only be limited. Politics takes on a dirty connotation because it necessarily involves doing only what is possible. As intimidating as it can be to participate in a pro-life demonstration, holding up a graphic picture of what abortion does, many Christians would rather participate in these activities than direct their efforts to pass laws that would “merely” limit the number of abortions. Given that politics is the art of what is possible, it means that politicians have to work with the sad reality that our society will not ban abortion today. At least two thirds of Canadians would oppose a ban on abortion, and some polls have the figure much higher than that. The political will to address the issue is even weaker than the public will. However, polls do show that at least 60% of Canadians would support some legal protection for the unborn (increasing protection with longer gestation). Given this reality, and given also the fact that every other country in the Western world has been able to pass abortion laws and restrictions, there is room for our Parliament to get rid of the gap between what Canadians would support and the status quo (no legal protection for unborn children). When pro-life politicians in this country have tried to do what is possible by advancing legislation, they are given very little support by the key organizations representing the political arm of the pro-life movement. 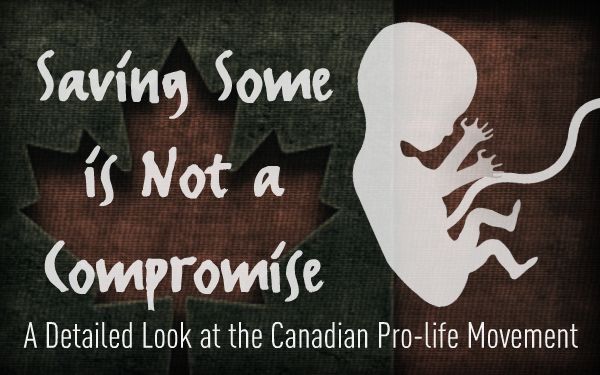 These politicians are often singled out as “compromisers.” With immense opposition from pro-abortion activists, the media, and even their own party, is it any wonder that after 20 years of this, most MPs, even pro-life MPs, are hesitant to touch the issue? “Because we have virtually no restrictions against abortion, we’ve been able to spend our time working on access and funding issues, instead of fighting oppressive laws, which is what our American friends must do. Restrictions such as consent laws, waiting periods, and the like are simply cruel and unnecessary obstacles that impede a woman’s ability to get a safe, early abortion. There is no question that the absence of restrictive laws against abortion places the struggle for abortion rights on the fast track to success” [emphasis added]. Ever since Canada’s abortion laws were struck down by the Supreme Court in 1988 there has been a strong division within the political arm of Canada’s pro-life movement. On the one side of the divide are those who argue that we ought to work to end abortion by enacting laws that restrict it as much as possible. If we can restrict access and increase awareness of what abortion really is then the number of abortions will drop and society will be more aware of just how evil it is. For example, if society is willing to criminalize abortion after 12 weeks gestation then we should work towards a law that does that. If it is successful, we move on to the next step and restrict it even further. Though gestational limits were not previously considered an option in the United States (because of their constitution), they have successfully applied this strategy to the point that over 80 laws restricting abortion in one way or another have already been passed this year alone. It must be noted that those in this camp are clear that they welcome laws that would chip away at abortion, as long as they meet the requirement noted above. But it isn’t just gestational limits that fail the test. As has been evident from recent attempts to introduce pro-life legislation in Parliament, logical consistency means many more pro-life bills become unethical. Does supporting informed consent legislation (where a mother has to be told about the level of development of her child, or what is involved with the abortion procedure before she can have an abortion) mean that we are supporting the abortions that occur once a woman has been informed and still decides to kill her child? Doesn’t that implicitly accept the killing of unborn children? Does banning coerced abortion (as MP Rod Bruinooge attempted to do with Roxanne’s Law last year) mean that we are implicitly tolerating abortions that have not been coerced? On the one hand they state that they are in favour of incremental legislation. Yet the reality is that over the past twenty years they have done very little to support the private member’s bills introduced by brave MPs. In some circumstances they have outright opposed them. Both options are a far cry from proactively advancing and building public support for abortion legislation. The key issue of debate between the two sides hovers around whether it is immoral or unbiblical to promote legislation that would have the effect of saving some, but not all unborn children. To put it another way, is it compromising to support a law that would ban abortion after 20 weeks? As one pro-life leader stated to me “Abortion is evil and if you say it’s ok that we allow some evil (abortion) in order to save some of the children then you are going against the moral order.” Those who hold to this view have admirable intentions, but they have flawed conclusions. And these conclusions are costly. Dispelling the flawed conclusions will reveal that we can, in good conscience and in harmony with our faith, limit the evil of abortion in the political realm. Argument 1 – This logic ignores the reality of our sin-filled society, which currently allows the killing of all unborn children, at all stages, for all reasons, and at taxpayer’s expense. There is a huge moral difference between advancing an abortion law when there is, and when there isn’t already an abortion ban in place. If the current law was a complete ban on abortion and a majority in society wanted to change that to a ban after 12 weeks or 20 weeks gestation, it would be immoral for government to pass this legislation. All human life should be protected and it is government’s responsibility to ensure that. The effect would be to increase the amount of evil, a direct assault on the role of government. However, if the current law allowed for the killing of all unborn children (as it does in Canada today), then a new law that would ban abortion after 12 or 20 weeks would reduce the evil. There is a substantial difference. That difference is called context. Reformed believers should be the first to understand the importance of applying our belief about human nature to our daily work. We may not like the out of control train, and we may disagree with the thousands of parents who tie their children to the track, and we might only be able to save a selection of the babies, but that does not mean that we should not do what we can to save some. Argument 2 – Supporting incremental legislation is not condoning the death of the children who are not protected by the new law. Society is condoning abortion – government must try to limit the evil. By supporting incremental legislation, we are not in any way compromising. We are working to abolish all abortion by taking the steps humanly possible in this sin-filled and limited world. By promoting a law that bans abortion after 18 weeks, for example, we are not in any way condoning abortion up till 18 weeks. The pro-life leader quoted earlier who opposed gestational limits wrongly believes that such a law would mean we are allowing some evil to save some children. But we aren’t allowing the evil. Our society has chosen the evil. The train is hurtling down the tracks whether we like it or not. Our sin-filled human hearts have chosen the evil. Our government has the responsibility to limit that evil as much as possible. If a ban on abortion is not humanly possible in such an evil society but restrictions on abortion are possible, it is the moral duty of government to enact those restrictions, to begin to engage the brakes on the train. We may not be able to stop the train dead in its tracks, but we should begin to apply the brake. This does not stop after a law is put in place. The restrictions have to keep increasing, as we see in the United States. Abortion clinics are closing their doors south of the border, not because all abortion is illegal, but because there are so many restrictions they can no longer justify operating. The Lord willing, some day we may get to the point where there is a complete ban on abortion. Argument 3 – Arguing against incremental legislation flies in the face of how we understand politics and the role of government on every other issue. Those who are convinced by the “compromise” arguments have to answer some questions themselves. For starters, how can we justify such a different standard when it comes to every other political issue that we engage with? With their logic, anyone who supports a bill that would increase the age of sexual consent from 14 to 16 is condoning or supporting all sexual activity after age 16. The reality is that the government has virtually no control on sexual activity, but it can try to prevent the exploitation of youth. Increasing the age of consent is a very important step towards accomplishing this. By no means does it mean that they are compromising on sexual purity. To take this a step further, every piece of legislation that crosses Parliament’s floor has problematic elements. But it would be much more problematic if MPs were unable to pass any laws, leaving society in a state of anarchy. For a society to function, our politicians have to tolerate things that we as Christians may not tolerate. But tolerate does not mean condone. It is easy for people to point at politicians from the sidelines and accuse them of being unjust. But it is the reality of working in a sin-filled world that has limits on what is possible. We can’t force people to be moral. But we can do our best to restrain evil. Perhaps this explains why the Canadian pro-life community has almost abandoned the political realm. We simply don’t like working in such a nasty, but real, world. Over the past 15 years we have seen smoking dramatically decrease in Canada. How was this accomplished? A wise strategy was employed. Education was a component, but government also enacted many laws and policies, such as health warnings on cigarette packages, increased taxes, banning advertising of public functions, and even hiding tobacco products behind curtains. The combination of the educational and political arm has reduced smoking to the lowest level ever, even among teens. What would have happened if our government tried to ban smoking 15 years ago? Or, to follow the logic used by some pro-life leaders, does making a law that requires these dangers to be shown on tobacco packages etc, mean that we implicitly condone tobacco use? It is well known that those behind the law are working towards a much bigger goal. The same applies to abortion. We should never stop with one bill that limits it or exposes the evil nature of it – we have to work toward a total ban. But that does not mean that we can’t try to get what is possible currently and work towards a ban one step at a time. The argument is made that the difference between abortion and other issues is that human life is at stake. Again, although that sounds noble, it is misled. Many other political issues also have lives at stake. The Canadian government does not devote 100% of its efforts to fighting starvation in Somalia because it recognizes that even its best efforts would have limited impact. Further, doing so would come at the cost of the many other issues and people that need attention. Once again, it comes down to recognizing that the role and power of government is limited. It can only do so much. The question we have to answer is, will we do what we can, or will we walk away? The “playing God” argument is a convenient means for us to avoid the responsibilities that God has given us. In a country like Canada, God uses citizens to govern. He calls us to make difficult, but important, decisions about how we will live. Because we are in a democracy, Romans 13 applies to each of us because we all have a hand in governing this nation. We can’t absolve ourselves of all blame. There is a reason why pro-life MPs are hesitant to put forward pro-life laws – almost nobody is standing behind them. That proves that citizens have a direct effect on our leaders and on the civil government’s responsibility to apply God’s truths to earth. If we did stand behind them, they would be much more likely to do something. We may not like the responsibility that comes with democracy, but by no means may we shy away from it. Last year some key pro-life leaders refused to support Member of Parliament Rod Bruinooge’s bill (Roxanne’s Law), which would have made it a crime to coerce a woman to have an abortion. Section 4 of that bill stated that it did not apply to physicians who tried to convince a pregnant woman to have an abortion if the abortion is necessary to “prevent serious threat to the female person’s physical health.” These pro-life leaders argued that the bill condoned the evil of abortion for the sake of the mother’s health. However, the reality is that abortion is already legal for any and every reason, including for the protection of the life of the mother. This bill simply acknowledged it because Bruinooge thought that was what was necessary to have the bill passed. Even if that was a poor decision or completely unnecessary, it does not negate the point that it reflected what the law already states. The process of chipping away at abortion will mean that we have to continually remind Canadians just how wide-open the laws currently are. Argument 6 – The fact that there are some options that most pro-lifers can agree on does not mean that they are the only options we should pursue. Just because part of the pro-life community does not support many pro-life laws does not mean that we should avoid those laws and concentrate on those they do support. Although it sounds considerate, we end up trying to be nice rather than do what is really best for the unborn. Prudence requires the right law at a specific time and in a specific context. We have to be wise in those situations and boldly advance abortion legislation that would be effective in limiting evil. With lives at stake we can’t devote all of our time to talking to ourselves. There are some foundational differences within the pro-life community (our view of human nature, the role of government, the end times, etc) that we will debate as long as we live. That debate should happen, but we can’t put aside our political responsibility while doing so. But if they have to vote on a bill that would ban abortion after 20 weeks, for example, they are forced to address the issue head on and can’t skirt the issue. Even Henry Morgentaler opposed abortion after 24 weeks. He has stated, “We don’t abort babies, we want to abort foetuses before they become babies… Around 24 weeks I have ethical problems doing [late-term abortions].” It would be hard for many MPs to defend it. And there is no way that they can argue that the bill is redundant, or that no abortions happen after 20 weeks anyways. A bill like that would make sense and could actually accomplish something, even if it did not pass the first time. Let’s not forfeit these options because we are trying to be nice. Argument 7 – This issue is not minor. Hundreds, even thousands of lives can be saved. In the face of controversy we can be tempted to just walk away. Indeed, that is what many of us have done. We don’t like to argue among fellow pro-lifers so we leave the political realm and move on to a different arm or a different cause. But the issue is not just another squabble. If we did boldly advance abortion legislation that is in keeping with public opinion today, well over 500 lives could be saved every year. Abortion takes the life of over 100,000 children every year (the specific numbers are unknown because many abortion providers don’t report what they are doing). In 2008, of the 24,087 abortions that were actually reported with gestational details to the Canadian Institute of Health Information, 1,028 occurred from 17-20 weeks gestation and 556 occurred 21 weeks and later. That does not include all of the abortions where no details were provided (let alone gestation), nor does it include the numerous abortions that are not reported at all. A law against abortion after 20 weeks saves real lives every year. Americans United for Life has been working with similar goals for a long time in that country. One example they provide of the success of working in the political arm is in Mississippi. There are many other benefits to introducing laws like these. First, the debate in Parliament and the media will open the eyes of Canadians to the ongoing reality of abortion. The less abortion remains hidden, the less it can be justified. Second, if a law like this were to pass it would have many spin-off consequences. For example, although many abortion-providers don’t keep statistics (even though it is tax-funded and deemed “medically necessary”) a ban on abortion after a specific age should force them to reveal the age of the child. It would also be a huge blessing to the disabled community. After all, many of the late-term abortions are done to kill children who have a disability. Finally, think of the impact this would have on the huge adoption wait-list! There are so many homes waiting for the gift of a child to adopt into their family. Argument 8 – Canada is the exception, not the norm. European nations that are as secular as Canada, if not more so, all have laws against abortion. Where it is available on demand, most countries limit it to a maximum of 12 weeks gestation. In other countries, including Spain, Portugal, and Poland, abortion is only allowed for specific reasons, such as the health of the mother, even if the pregnancy is less than 12 weeks gestation. In Holland abortion is allowed on demand up until 13 weeks, but a 5-day waiting period is required. In Greece abortion is illegal after 12 weeks gestation (24 weeks for cases of fetal abnormality). Abortion is illegal in Ireland, though about 7,000 women travel to Great Britain each year to get an abortion. In that country it is allowed until 24 weeks. And in Sweden, a country often held up as an example of progressivism, abortion is illegal after 18 weeks except to save the life or physical health of the mother. Canada is the one country in the West where this evil act is completely unrestricted. The only way to change that will be by boldly, and publicly, declaring the truth about abortion while at the same time introducing laws that would limit it. Argument 9 – If you don’t make a concession, you don’t compromise. After reading all of these arguments, some will still want to label this proposal for advancing abortion legislation a type of compromise. But that is wrong. Compromise involves a mutual concession to reach an agreement. Nowhere in this argument am I proposing that we should concede anything. To put it even stronger, from a legal and political perspective it would be hard to make the case that we could even concede anything because we have nothing to concede – unborn children have no legal protection. We can fight to change that without making concessions. (In the sidebar accompanying this article, “When it is compromise,” I warn against conceding our foundation, by avoiding any language that suggests that some children are more worthy of legal protection.) Let’s not put stumbling blocks on our own path. All pro-life Canadians are committed to protecting life from conception to natural death. It is time to point our swords away from each other and direct them towards the evil of abortion. The three arms of the pro-life movement are each critical, and must work together to end abortion. Now, after more than 20 years of effective work by the pastoral and prophetic arms of the movement, Canada has become increasingly pro-life. It is time for the political arm of the pro-life movement to advance laws that reflect where Canada really is on the abortion issue. There is no need for us to fight within the pro-life community. If we are uncomfortable working in the political arm, we can move to the prophetic or pastoral arms and still be an effective voice. What matters is that we encourage each other with our respective roles. We can also hold each other accountable. It is good for those outside of the political arm to remind those in it to never allow compromise in their words or deeds. · Give continual encouragement to all who work in the pro-life movement. Satan is pushing hard from every direction and would love us to move away from the issue. Sadly, many churches and Christians have. At the same time, let’s challenge our pro-life community to make progress in the political realm. A new generation of leaders is emerging, many of whom are unfamiliar with the divide that has held us back for over 20 years. The Lord willing, we can look forward to some encouraging victories in the years ahead. Mark Penninga is the executive director of ARPA Canada (www.ARPACanada.ca). ARPA Canada exists to educate, equip, and encourage Reformed Christians to political action and to shine the light of God’s Word to Canada’s municipal, provincial, and federal governments. This article was published in Reformed Perspective, a magazine for the Christian family.